Despite a breakthrough bipartisan agreement to fund the federal government and avert another shutdown, a faceoff between the Trump administration and Congress on border spending is now in the hands of the courts. The outcome of this legal battle, which could reset the boundaries between executive and congressional control over spending, will have consequences that go far beyond the realm of immigration. Unhappy with the $1.375 billion allocated for the wall in the agreement he signed, President Trump declared a national emergency that—unless enjoined by the courts—could potentially allocate $6.1 billion more for border barriers. While the wall funding took center stage in the spending negotiations, it was not the only point of contention for negotiators. In the immigration realm, perhaps no area has had more back and forth over whose views prevail in spending decisions than immigration detention. Indeed, funding for immigration detention has been a matter of contention between Congress and the executive branch for a number of years, as this article explores. Democratic negotiators’ initial bid in the high-stakes spending talks was to limit U.S. Immigration and Customs Enforcement (ICE) to 16,500 detention beds for enforcement purposes in the U.S. interior. This demand was clearly motivated by Democrats’ desire to stem rising interior enforcement occurring under the Trump administration. But it tapped into Congress’s bipartisan frustration with ICE for overspending and mismanaging its funds, especially relating to detention. Even though ICE received funding for 40,520 beds in fiscal year (FY) 2019, the detained population reached a high of 49,057. However, Congress ultimately did not curb ICE’s discretion to go beyond its prescribed spending limits. Thus, even though the Constitution gives Congress the exclusive power of the purse, the administration retains flexibility when it comes to immigration enforcement spending. ICE manages a large, complex, and sprawling detention system. Unlike jails and prisons, which serve a punitive function, immigration detention was intended only to ensure that foreign nationals attend hearings and comply with removal proceedings. Under U.S. law, there is broad authority to detain foreign nationals facing deportation. The law also mandates that certain foreign nationals be detained while in removal proceedings, including those who have committed serious crimes. Removal proceedings are technically civil, not criminal in nature. As a result, ICE detainees have no right to a government-appointed attorney, unlike in the criminal justice system. Yet ICE detainees are frequently held under the same conditions and restrictions as convicted criminals. ICE’s average daily detainee population increased by more than 500 percent between FY 1995 and FY 2019, rising from 7,475 to a high of 45,671. In the aftermath of the 9/11 terrorist attacks, the ICE detainee population grew rapidly alongside increases in interior enforcement, as public unease over illegal immigration sharply intensified. As immigration enforcement came to be viewed increasingly through a national-security lens, Congress demonstrated new willingness to fund immigration enforcement, including detention. So did lawmakers’ deference to the Department of Homeland Security (DHS) for deciding who to detain. Congress dramatically increased funding for ICE detention, and even required the agency to maintain a minimum number of beds. However, lawmakers began noticing mistakes in ICE’s budgeting practices. To budget for detention, the agency calculates both the daily bed cost rate (the cost per foreign national for one day and night in detention) and the average daily population in detention. In its FY 2015 budget request, for example, ICE made an error that resulted in an underestimation of $129 million required for detention. Though some of the factors responsible for the wrong estimates were beyond ICE’s control, Congress saw it as an issue of mismanagement, and indeed the Government Accountability Office (GAO) recently found that for years ICE’s calculations have included a number of inconsistencies and errors. In the FY 2015 explanatory statement accompanying that year’s appropriations bill, Congress for the first time admonished DHS for its budgeting practices and ordered it to “stop employing misleading and operationally harmful budgeting gimmicks.” This was to be the first of several admonishments. Yet while Congress has been increasingly rebuking ICE, lawmakers have also increasingly given DHS wide discretion to add to detention spending. For the first time in the FY 2013 DHS appropriations bill, Congress added a provision allowing DHS to increase funds for detention by shifting money around from other priorities, so long as it notified Congress. Congress likely did this because its appropriations paid for just 31,300 of the 34,000 beds it had mandated that year. DHS took full advantage of this discretionary authority. On March 8, 2013, ICE requested reprogramming $38 million in user fee revenue for detention beds. Because of a lower than planned average daily population in FY 2015, ICE reprogrammed $111.3 million out of custody operations. The following year, it shifted $50.8 million into custody operations. Legislators in 2017 made the reprogramming and transfer language even more permissive, no longer requiring that DHS propose the changes, but saying the Homeland Security Secretary “may reprogram and transfer funds within and into ‘U.S. Immigration and Customs Enforcement-Operations and Support’ as necessary to ensure the detention of aliens prioritized for removal.” ICE’s resulting reprogramming that year may have been the highest ever, amounting to $370 million. In 2018, ICE reprogramming decisions came under fresh scrutiny when DHS notified Congress it was transferring $200 million from the budgets of various agencies—including nearly $10 million from the Federal Emergency Management Agency (FEMA)—to fund detention and removal. Critics decried cutting FEMA funds at a time the United States was anticipating the biggest hurricane ever north of Florida, though only a portion of the funds were cut from the FEMA office that organizes emergency operations. As congressional admonitions and ICE reprogrammings have increased, so has the daily population of noncitizens in detention—rising more than 40 percent during the first two years of the Trump administration. The current average daily population is at its highest ever: an average daily rate of 45,671 as of January 26, 2019. Bedspace requested by DHS also increased dramatically during the administration’s first year, from 30,193 to 51,379 (see Table 1). Notes: Average Daily Population (ADP) for 2019 is as of January 26, 2019. The 2018 ADP number is the U.S. Immigration and Customs Enforcement (ICE) September 2018 forecast for the end of the year adult ADP (40,379) plus 2,500 beds reserved for families. During FY 2010-11, Congress mandated DHS maintain a minimum of 33,400 beds and for FY 2012-17, mandated a minimum of 34,000 beds. Sources: Department of Homeland Security (DHS), Congressional Budget Justification (Washington, DC: DHS, various years); Senate Appropriations Committee, “Explanatory Statement, Department of Homeland Security Appropriations Act,” various years; DHS, Budget Overview FY 2019 (Washington, DC: DHS, 2018), available online; DHS, “FY 2018 Transfer and Reprogramming Notifications,” accessed February 27, 2019, available online; Julia Ainsley and Heidi Przybyla, “Why the Trump Admin Wants More Detention Space for Migrants and Democrats Want a Limit,” NBC News, February 11, 2019, available online; DHS Office of Inspector General (OIG), ICE’s Release of Immigration Detainees (Washington, DC: DHS OIG, 2014), available online; DHS, “Budget-in-Brief Fiscal Year 2016,” accessed February 27, 2019, available online; U.S. Government Accountability Office (GAO), Immigration Detention: Opportunities Exist to Improve Cost Estimates (Washington, DC: GAO, 2018), available online. While both parties went into the budget negotiations intent on avoiding another government shutdown—after the partial government shutdown lasted a record 35 days in a stalemate over funding for the wall—they were uncertain whether Trump would support less than his sought-after $5.7 billion for the wall. Democrats were also intent on capping detention, with the idea that doing so for interior bedspace would force ICE to resume more targeted enforcement. Trump, on taking office, quickly rescinded Obama administration immigration enforcement priorities that targeted individuals with serious criminal records, recent border crossers, and those violating recent deportation orders—leaving the vast majority of unauthorized immigrants at little risk of detention and removal. As a result of the Trump administration’s shift, the number of noncriminals arrested by ICE in the U.S. interior has more than tripled—from 15,353 in FY 2016 to 53,441 in FY 2018. Democrats and immigrant advocates vocally oppose these enforcement policies. This set the stage for what had begun as a Twitter hashtag, #AbolishICE, to evolve into an actual platform that was soon adopted by some Democratic candidates for office. Though few party leaders embraced the stance, Democratic negotiators went into the shutdown-avoidance talks feeling pressure to reduce ICE funding, especially for detention. Negotiators ultimately agreed to provide ICE funding for 45,724 beds for FY 2019—a victory for congressional Republicans and the Trump administration, as it marked a far higher level than Democrats had sought. In theory, in order to reach this average by the end of the fiscal year on September 30, ICE would have to gradually decrease the detainee population from the 49,057 currently detained to 40,520. However, the spending measure retained the permissive funding language, allowing DHS to transfer or reprogram money for detention as necessary.. However, the measure provides more funding than expected for alternatives to detention (ATDs; for example, electronic monitoring bracelets), including money for 100,000 participants, up from ICE’s predicted 82,000 participants. And it includes $30.5 million for the Family Case Management Program, an Obama-era ATD program that the Trump administration shuttered in June 2017. While the Democrats can claim success in the increased ATD spending and potential decrease in detention space, the spending agreement is unlikely to force ICE to decrease the numbers of people detained. The final legislation contained $1.375 billion for 55 miles of physical barriers in the Rio Grande Valley, less than the $1.6 billion in the President’s original FY 2019 budget request, and far less than his later demand for $5.7 billion that led to the partial government shutdown. After he signed the bill, Trump declared a national emergency and his administration announced other steps to tap into $6.1 billion from Treasury Department and Department of Defense budgets, for a total $8 billion for physical barriers. In FY 2017 and 2018, Congress appropriated $1.68 billion for repairs or construction of fencing along the southern border. To date, DHS has so far replaced 34 miles of fencing but has yet to construct any barriers in additional locations. The U.S. government first began erecting fencing in the 1990s, initially with a 66-mile fence in the San Diego area, later followed by fencing in El Paso and other highly trafficked areas. With passage of the Secure Fence Act in 2006, fencing was expanded to its current total of 652 miles. Soon after he declared an emergency on February 15, multiple groups filed suit, including 16 states led by California and New York. How much the President will ultimately be able to expand the fence beyond the current 652 miles will ultimately be determined by the outcome of the legal challenges to his emergency declaration. The addition of 4,000 visas for the Afghan Special Immigrant Visa (SIV) program, extending a program that has allowed Afghans who provided support to the U.S. military and other government agencies to gain residence in the United States. Ending the practice of ICE enforcement against sponsors of unaccompanied child migrants. In 2018, ICE began using information about potential sponsors for enforcement purposes, arresting 170 potential sponsors as of December 2018. 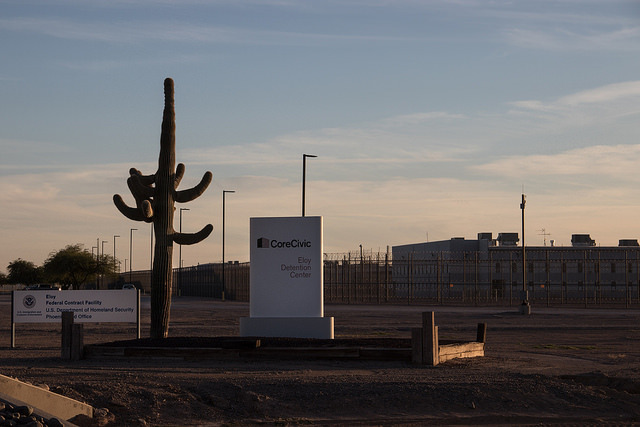 The practice made potential sponsors hesitant to come forward and drove up the number of unaccompanied children left in Department of Health and Human Services (HHS) custody, reaching a high of nearly 15,000 children in December 2018. Funding 50 additional immigration judge teams, bringing the total authorized to 534—a significant addition for a court system struggling with a backlog of more than 829,000 cases. Improving U.S. Customs and Border Protection (CBP) holding facilities to provide better conditions and access to medical care to migrant arrivals, who increasingly are comprised of unaccompanied minors and families traveling with children. The reforms come after the deaths of two children and one man in CBP custody, leading CBP Commissioner Kevin McAleenan and others to state that Border Patrol facilities are not built for today’s flows and that funds are needed for medical and mental health care, especially for children. The administration’s plan to deny admissions to would-be immigrants who potentially could use public benefits and penalize already present ones for past or current usage appears to be off to an early start, even as a key aspect has yet to be finalized. Newly issued figures from the State Department show that consular officials have been increasingly denying immigrant visas on the basis of a determination of public charge. A total of 13,450 green-card applicants received an initial “inadmissible” determination on public-charge grounds in FY 2018, up from 1,076 in FY 2016—a more than tenfold increase. Moreover, the share of these initial determinations that were ultimately overcome, allowing individuals to get green cards, fell from 85 percent in FY 2016 to 59 percent two years later. The data appear to reflect changes the State Department made to its Foreign Affairs Manual in January 2018, increasing the number of indicators that could lead to a public-charge determination. Still, the number of applications denied on public-charge grounds remains a small share, accounting for 4 percent of the 323,350 applications rejected for inadmissibility in FY 2018—and just 1 percent of all 533,557 immigrant visas issued by the State Department that year. The State Department changes represent just one aspect of sweeping public-charge revisions the administration has put forth. A proposed public-charge rule that would deny green cards based on past or potential future use of public benefits is in the final stage of review and could be issued later this year. It would add consideration of other benefits program usage and new factors in the determination of whether someone is or potentially could be a public charge. The Migration Policy Institute found that 69 percent of recent green-card holders would have at least one negative factor under the proposed rule, while only 39 percent would have sufficient incomes to meet the heavily weighted positive factor. If this rule becomes final, public-charge denials could rise from a very small share of green-card applications to a substantially higher one. Even as Its Policy Is Challenged in Court, Administration Continues Sending Asylum Seekers to Mexico. On February 13, the Department of Homeland Security (DHS) sent a group of families who are in the process of applying for asylum in the United States back to Mexico; the first to fall under the Migrant Protection Protocols—better known as the Remain in Mexico policy. The families, including 13 children, will have to wait in Mexico until decisions are issued in their asylum cases. As of February 21, 112 people had been sent back to Mexico under the new protocols. The day after the United States returned the first families to wait in Mexico, a group of advocacy organizations, including the American Civil Liberties Union, sued the U.S. government on behalf of 11 asylum seekers required to wait in Mexico. The lawsuit claims that the policy violates U.S. and international law and calls for an immediate ruling enjoining it. This is the first major legal challenge to the policy, which has been in place at the San Ysidro port of entry since January 28. Mexico Closes Shelter Holding 1,600 U.S. Asylum Seekers. Officials in northern Mexico announced the closure of a shelter that recently housed about 1,600 Central American asylum seekers. These migrants arrived at the U.S.-Mexico border hoping to request asylum at the port of entry in Eagle Pass, Texas, but Mexican authorities corralled them into the shelter and only about a dozen were allowed to request asylum each day. In the meantime, U.S. Customs and Border Protection (CBP) said it could process fewer than 20 migrants a day for asylum screening at the Eagle Pass port of entry. Supreme Court to Weigh Addition of Citizenship Question to Census. The Supreme Court agreed to review in its current term a challenge to the Trump administration’s decision to add a question about citizenship status to the 2020 census. The court will take up the case and hear oral arguments in late April. This grant of review is a departure from the court’s normal procedure to await a ruling from a federal appeals court. In January, a federal district court issued a ruling that barred the government from including the citizenship question on the 2020 census. The administration then asked the Supreme Court to review the trial court’s decision immediately, without requiring the government to appeal first to the Second U.S. Circuit Court of Appeals. The census questionnaire must be finalized by the end of June, meaning it would have been virtually impossible for the Supreme Court weigh in before that, if the administration waited for the appeals court’s ruling. District Court Enjoins Justice Department from Limiting Funding for Sanctuary Jurisdictions. A federal judge in California issued a permanent nationwide injunction prohibiting the Justice Department from conditioning grants on a jurisdiction’s compliance with immigration enforcement. The conditions had been placed on the Justice Department’s awards of the Byrne JAG local law enforcement grant and its awards under the Gang Suppression Grant Program. They required jurisdictions to comply and, in some cases, participate in immigration enforcement activities, including notifying U.S. Immigration and Customs Enforcement (ICE) of upcoming release dates of suspected removable noncitizens, and allowing ICE access to jails and prisons to interview detainees. The conditions were part of the Trump administration’s broader efforts to restrict funding to sanctuary cities—starting with an executive order on January 25, 2017—all of which have encountered legal obstacles. In a related development, the Third U.S. Circuit Court of Appeals upheld a district court ruling finding that the Justice Department cannot cut off grants to Philadelphia for its refusal to cooperate with certain immigration enforcement activities. The three-judge panel unanimously found that the Attorney General did not have the power to add these conditions. Department of Defense Sends 3,750 More Troops to the Border. The Defense Department announced it is sending an additional 3,750 troops to the Southwest border for three months. The troops will operate mobile surveillance cameras in Arizona, California, New Mexico, and Texas. Some will also string up 150 more miles of concertina wire. The deployment will bring the total number of active-duty troops at the border to about 4,350. The Pentagon first approved the deployment of U.S. troops to the Mexico border in October 2018. USCIS Changes the H-1B Lottery Process. The Trump administration published a final rule changing the annual selection process for new H-1B visas. The rule will change the order of the lotteries U.S. Citizenship and Immigration Services (USCIS) conducts, giving priority to and thus increasing the number of selected applicants who have received advanced degrees from U.S. universities. This change will be implemented starting with the FY 2020 cap, which opens in April 2019. The rule will also implement a registration program, in which, prior to the annual selection process, applicants will only register online instead of submitting a completed application. If USCIS receives more applications than the 85,000 annual limit on new H-1B visas, the lottery-selection process will then be triggered, and among those who registered, only those picked will be invited to submit full applications. Amid concerns that the online registration program could not be adapted quickly enough for the upcoming selection for FY 2020, the program will be implemented for the FY 2021 cap, in April 2020. State Department Will Implement Sanctions on Ghana for Failure to Accept U.S. Deportees. DHS announced that the State Department will implement visa sanctions on Ghana because it has “denied or unreasonably delayed accepting their nationals ordered removed” from the United States. The restrictions affect employees of Ghanaian diplomats, businessmen, and employees of the Ghanaian legislature. After the announcement, Ghana’s foreign ministry denied the allegations of noncooperation. The Trump administration has been actively seeking to reduce the number of recalcitrant countries—those that fail to accept their nationals ordered deported from the United States. Ghana is the seventh country to be sanctioned by the Trump administration, following Cambodia, Eritrea, Guinea, Sierra Leone, Burma, and Laos. Amid Mounting Public Pressure, ICE Stops Force-Feeding Immigrants. ICE stopped force-feeding a group of men on a hunger strike in an El Paso immigration detention center. The practice, which involved feeding detainees through nasal tubes against their will, drew legal scrutiny and national and international criticism. The Office of the UN High Commissioner for Human Rights said the force-feeding could violate the UN Convention Against Torture. And a U.S. district judge ruled the government had to stop force-feeding two of the detainees, but said if their health started to decline, he would consider ordering the forced nutrition to restart. The group included nine detainees from India and three from Cuba. The force-feeding began under a court order earlier this year. ICE Created a Fake University to Catch Immigration Fraud. Charges were announced this month against students who had enrolled in a fake U.S. university. The bogus university was part of a DHS undercover operation designed to expose immigration fraud. DHS argues the students knowingly enrolled to falsely maintain their student visa status and remain in the United States. As a result of the operation, ICE arrested 146 immigrants, most of whom are from India. The operation is similar to one conducted two years ago in New Jersey, which resulted in more than 1,000 foreign nationals being placed in removal proceedings. Some students have argued they did not knowingly enroll in the fake university, on the basis that the university regularly upheld its accreditation and kept informing them that classes would start soon. The Indian government demanded immediate access by Indian consular officials to the detainees. William Barr Confirmed as Attorney General. The Senate voted largely along party lines, 54 to 45, to confirm William Barr as Attorney General. Barr is expected to continue the muscular immigration agenda set by his predecessor, Jeff Sessions. In his confirmation hearing, Barr spoke in favor of a wall, decried “sanctuary” cities that limit cooperation with ICE, and endorsed the Remain in Mexico plan for asylum seekers. As Attorney General under President George H.W. Bush, at a time immigration enforcement and benefits delivery was under the purview of the Justice Department, Barr pushed a hawkish agenda on immigration and refugee policies, including authorizing the use of Guantanamo Bay to hold Haitian refugees intercepted at sea. Barr also increased security along the Southwest border—especially in San Diego—and increased interior enforcement. Texas Conducts Flawed Review of Voter Rolls. Acting Texas Secretary of State David Whitley’s office earlier this month issued a press release calling into question the citizenship of 95,000 registered voters. To generate the list, the office matched voter registrants with individuals identified by the Texas Department of Public Safety as noncitizens, and thus ineligible to vote. Democratic lawmakers and advocacy groups raised serious questions about the accuracy of the list. The controversy spurred a statewide effort by county officials to parse through voting records to ensure all registrants were citizens, and asking many to prove their citizenship. A substantial number of those flagged were found to be U.S. citizens—forcing the Secretary of State’s office to eventually walk back its initial findings. Three federal lawsuits were filed challenging the legality of the review effort. States Order National Guard to Withdraw. The governors of New Mexico, California, and Wisconsin ordered their state National Guards to withdraw most of their troops assigned to the Southwest border. President Trump originally called for the deployment in April 2018 amid seasonal uptick in illegal crossings and reports of “caravans” of Central American migrants traveling toward the border. The troops were assigned to support CBP activities, but not enforce immigration laws. New Mexico Governor Michelle Lujan Grisham ordered the National Guard to retain just 11-15 guardsmen in the southwest corner of the state, which has seen a significant influx of Central American families in recent months. California, which agreed to the deployment only after being reassured that the guardsmen would focus on fighting criminal activity and not engage in immigration enforcement, is withdrawing about two-thirds of its troops at the border. California Governor Gavin Newsome will retain 100 soldiers at the border to combat drug trafficking. One week after New Mexico and California announced withdrawal orders, Wisconsin Governor Tony Evers ordered all 112 of his state’s troops to return home. Randy Capps is Director of Research for U.S. Programs at MPI.